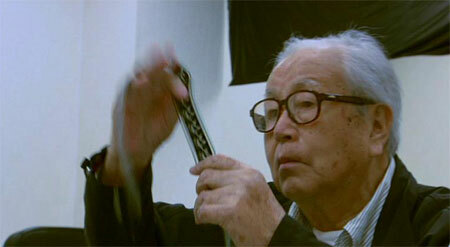 Director Kon Ichikawa at age 92, still active working as a director. The Skinny: A unique documentary about a true cinema legend, Filmful Life is required viewing for all Japanese cinema buffs and a required companion piece for all Ichikawa retrospectives. The film is also a rare case where subtitles may even be a reason even for Japanese audiences to stay away. Kevin Ma: Kon Ichikawa is one of Japan's most prolific filmmakers. Between 1948 and 2006, he made 76 films (that's 1.31 movies a year), including some featuring abhorrent sexuality, cannibalism in a war zone, murder mysteries, and even people in bird suits. At age 92, Ichikawa made Murder of the Inugami Clan, a self-remake of the 1976 classic The Inugamis. Directing the film at such an advanced age was an amazing feat, earning Ichikawa his own documentary, Filmful Life, simply named The Ichikawa Kon Story in Japanese. The strangest (and potentially the most brilliant) decision producer Taka Ichise made was picking director Shunji Iwai, who literally encompassed 58 years of Ichikawa's work into 80 minutes of short film clips and photographs. With a director like Iwai, whose unique visual style is claimed to be inspired by Ichikawa, you know Filmful Life won't be going the usual "talking heads" documentary route. In fact, Ichikawa himself doesn't even make an appearance until the last two minutes of the film. Filmful Life plays like a documentary from the silent film era, connected by intertitles that read like a film class essay on Ichikawa written by Iwai, and photographs digitally manipulated to make them appear to be moving. Based on extensive interviews between the two directors (some of them are included in the DVD and are never shown in the film itself), Filmful Life is essentially split into three sections. One, before the beginning of Ichikawa's directorial career, when he managed to avoid military duty during World War II and, during a stint as an animator, predicted the United States would win the war after watching Walt Disney's Fantasia. Two, his marriage to screenwriter Natto Wada, and their subsequent 28 collaborations. And three, his career after Wada's death, emphasizing the Kindaichi series (including The Inugamis and its remake). Those familiar with Ichikawa's work will find the second section the most rewarding and touching due to its emphasis on Wada's importance in some of Ichikawa's most successful films. Even for those not familiar with Ichikawa, this section humanizes the master greatly by placing him in a rare vulnerable position where he is not just portrayed as a legend, but also as a devoted husband who could bring himself to change a film's ending simply because his wife said so.